Relations between the U.S. and Russia are strained when Russian military leaders claim that the U.S. government has been compromised by the Goa'uld. There is a growing sentiment in Moscow that the United States has not been keeping up its end of the bargain to share information and technology gained through the Stargate program. The Trust wants to foster this mistrust and turn one of the U.S.’s greatest allies against it, even as far as demanding Earth’s only Stargate (on loan since “Redemption, Part 2”) be returned to them — or, better yet, to the point of nuclear war, since the Trust is now controlled by the Goa’uld. The Trust now wants to make a direct grab for power, instead of staying in the shadows as they have always done — a significant change in their modus operandi. This is no doubt because the members of the Trust — largely, or perhaps entirely, and including its key leadership — have been taken as Goa’uld hosts. The Trust transported their people and Kinsey out of the house with Asgard transporter technology, equipped on the Goa’uld Al’kesh they recently stole (once belonging to Osiris) (“Endgame”). The Al’kesh has returned to Earth, and the Trust has fixed the cloaking device to prevent its detection in orbit. According to Tok’ra intelligence, the Trust has made at least two attacks against Goa’uld-occupied worlds using the engineered symbiote poison after SG-1 recovered the Stargate from them and they fled the solar system (“Endgame”). Without a Stargate the member or members of the Trust who escaped with the Al’kesh were forced to leave our solar system and head out into the galaxy to use the poison-packed rockets, exposing them to possible capture. In fact they likely were captured, as the Goa’uld have now taken over the Trust. They could have brought dozens or hundreds of symbiotes back with them to infiltrate Earth, thus gaining access to such things as the advanced Ancient outpost in Antarctica. Just how far their infiltration has gone remains a mystery. Daniel theorizes that the Goa’uld in Kinsey is in the service of a System Lord. It’s likely not Baal who is pulling the strings, he theorizes, because he is so busy taking over the galaxy in his war against the System Lords to worry about setting the nations of Earth against one another. The Trust apparently did not intend to use Kinsey to actually attempt an assassination on Russian General Kiselev, nor to implant a symbiote in the General (as he already has one). Instead, the Trust apparently intended for Kinsey to be captured and revealed as a Goa’uld (thus the reason for placing a symbiote in him). Because Kinsey was recently Vice President of the United States, this would serve their goal of convincing the Russian government that the U.S. administration has been compromised by the Goa’uld at the highest levels — sparking tensions that could lead to war, especially with Kiselev, as one of their Goa’uld allies, having oversight of the Russian nuclear weapons program. Colonel Chernovshev, General Kiselev’s right-hand man, was involved in the plot to sell a Goa’uld symbiote to elements of the Trust several years ago, who at that time were working within the N.I.D. Was this the same symbiote that Harry Maybourne obtained and sold to ailing billionaire Adrian Conrad (“Desperate Measures”)? It is possible that Maybourne used some of his old rogue N.I.D. contacts to obtain the symbiote. The Goa’uld-infested Kinsey probably escaped the Al’kesh before it was destroyed: When last we saw him, he took the Trust agent’s hand device and Asgard transporter activator. He could be anywhere on Earth, with full knowledge of the Stargate and other government secrets, and Stargate Command will likely presume that he is dead. A photograph of Jack’s late son Charlie hangs on the wall next to his front door. Above his couch is a family photo with Jack, his ex-wife Sarah, and Charlie. The side of the surveillance van reads “Mikita Couriers,” after the episode’s director, Andy Mikita. The current leader of Russia is President Mikhailov. Robert Kinsey – After resigning from the Vice Presidency, Kinsey also found himself ostracized by the Trust — he had lost his value to them. 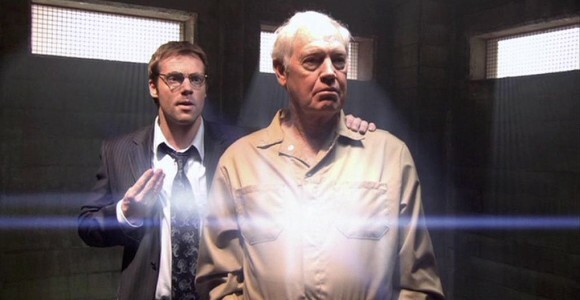 But when they approached him with a plan to sell out to the Russians, Kinsey went straight to Stargate Command. He is a patriot at heart. The Trust wished to exchange a large cash payment for a meeting with Russian General Miroslav Kiselev, a personal acquaintance of Kinsey’s. Kiselev has oversight over the Russian nuclear program, and (unbeknownst to Kinsey) is now a Goa’uld host. Having been taken over by the Goa’uld themselves, the Trust placed a symbiote in Kinsey’s head to service their plans: The former V.P. would be discovered by the Russians and found to be a host, leading them to believe that the U.S. government has been compromised by the Goa’uld at the highest levels. Kinsey is now host to a Goa’uld whose motives and allegiances are a mystery, and he likely escaped the Al’kesh back to Earth before the ship was destroyed. Chekov – As Russia’s key representative to Stargate Command, Colonel Chekov did everything he could do avert a Goa’uld-instigated war between Russia and the United States. He continually represented the best interests of his nation while working closely with General O’Neill. Chekov’s right-hand “man” is Captain Daria Varonakova. When did the escaping member(s) of the Trust return to Earth? Which Goa’uld were the symbiotes inhabiting the Trust serving? A System Lord? How were they originally captured? Are there any surviving members of the Trust, either leadership or foot soldiers? Any who are not hosts to Goa’uld? Is General Kiselev really a Goa’uld host? When and how did he become infested? Was he involved with the short-lived Russian Stargate program four years ago, perhaps even traveling off-world himself (“Watergate”)? Will General Kiselev be captured and proved to be a Goa’uld host? Was he working directly with the Goa’uld that took over the Trust, or does he have his own allegiances? What are his intentions in remaining on Earth, apparently playing the role of a Russian General for several years? Who among the rogue N.I.D. was working with the Russians to obtain a Goa’uld symbiote? Was one of Maybourne’s former rogue N.I.D. contacts involved in the operation to secure the symbiote he sold to Adrian Conrad? What caused the Russians to stand down their attack? Did the Russian President regain control over the military forces attempting to launch nuclear weapons without authorization? “The writers and I always viewed Kinsey’s forced resignation as an opportunity to explore new directions for Kinsey. Once he’s ‘outside’ the government, there are so many more directions he can go. I think this new direction can be loyal to the original concept of the character. What we’re trying to do is have it both ways — a thinking man’s villain with an agenda, and one that is capable of moving outside the usual expectations of him. VOTE! How would you rate SG-1's "Full Alert?"